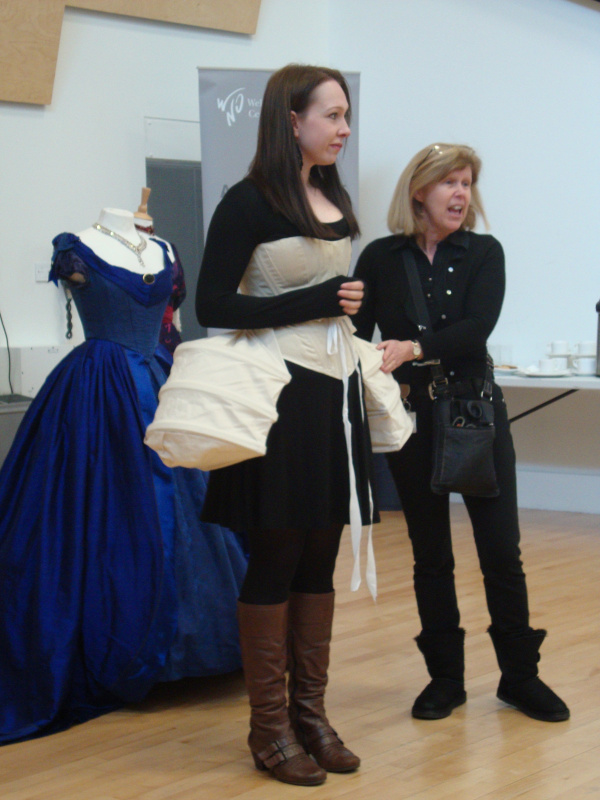 Corsets fun at the Opera! Remember Louise from our previous ‘A Day in the Life of PR’? Well here is she is again, being a lucky old so-and-so and popping up the M5 to Cardiff to spend the day with Welsh National Opera’s wardrobe/costume department. It’s not unheard of for me to spend my weekends pretending I’m Elizabeth Bennett looking for Mr Darcy, or one of the ladies of the court of Elizabeth I (I’m part of a historical dance group, which includes wearing the costumes when we’re performing). 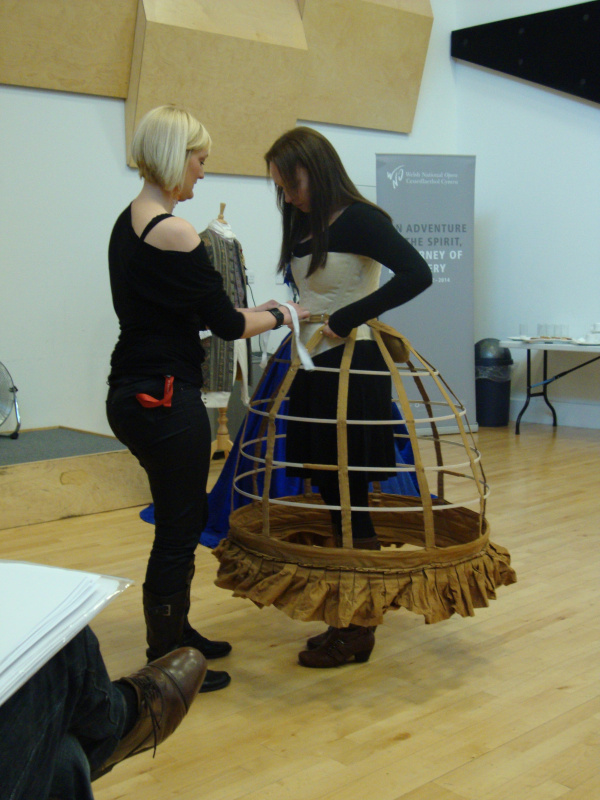 So I was thrilled to get the chance to have a look behind the scenes at Welsh National Opera before they visit the Theatre Royal in April and find out a bit more about their costume department. 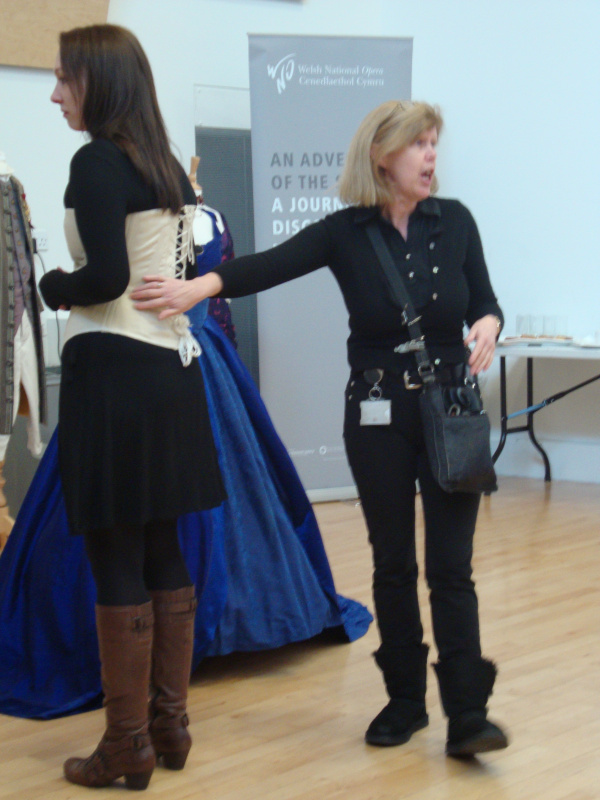 Even with breathing space, the women have to make sure they put on their boots before they get laced into their corsets, as the corsets have to be so tight, the women can’t bend over once they’re on! The men don’t get away with it either – all their bow ties are the real thing and have to be tied by hand. The WNO dressers specialize in either male or female costume, and have perfected the art of lacing a corset or tying a bow tie quickly. Their work’s even more impressive once you find out all the performers get into their costumes in the half an hour just before curtain up, when performers are also doing their vocal warm-ups and trying to calm any last minute nerves. Judith then showed me how they create different skirt shapes, using bustles (to give you a larger behind), petticoats (to make the skirt bigger in all directions), panniers (which add volume around the hips to make the skirt wider) and crinolines (big metal hoops held together with cotton strips which make the skirt huge in all directions – the cotton strips also let the crinoline collapse down when it’s not being worn, so it’s easy to transport). 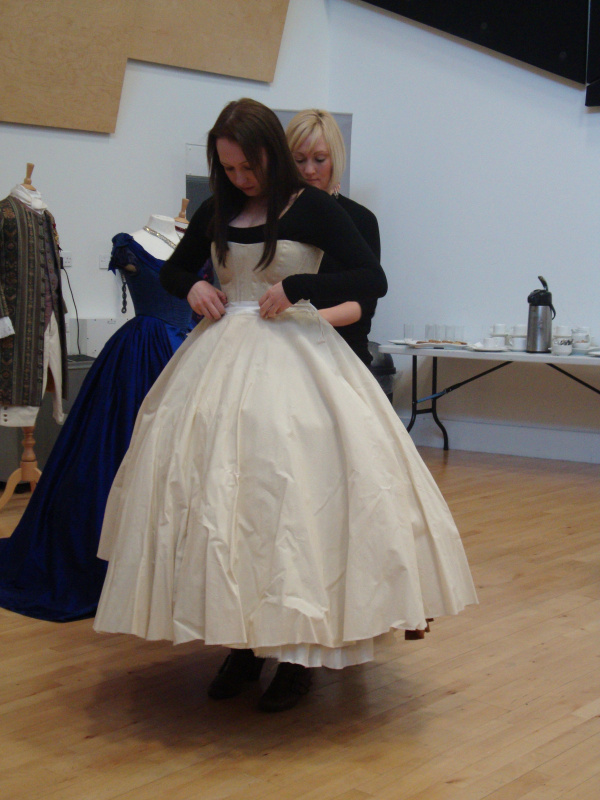 Once this layer is complete, a petticoat is put on over it, and then the dress can go on. Although the costumes look impressive and are perfect to wear on stage, getting up and down stairs, along narrow backstage corridors or through doorways can be tricky for the women wearing them. Everything is made by WNO and is as historically accurate as possible, although modern fabrics have to be used to make sure the costumes are durable enough to tour and can be cleaned easily. And talking of cleaning, the WNO wardrobe team has to do a LOT. The costumes including things like bloomers, socks and vests which Judith said can get a bit ‘whiffy,’ so cleaning the costumes from the night before is always the first job of the day. The wardrobe team has their own travelling launderette to plumb in at every venue, with washing machines, driers, dry cleaning equipment, steamers (which look like hoovers but actually help get creases out of clothes without ironing them) and a variety of stain removers Judith says can get rid of virtually any mark. When there are three different productions, like there will be in Plymouth, Judith says it takes between 2 to 4 hours to switch the wardrobes between shows, from gathering up everything from the last show to laying out costumes in the dressing rooms for the next performance. 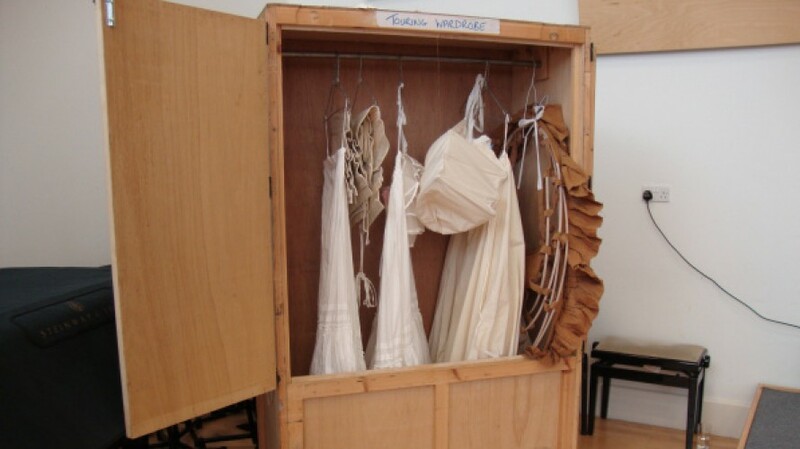 Once a production has finished its tour, all the costumes are stored in a massive warehouse, which already houses costumes from shows over the past 20 to 30 years. Recently, they’ve started hiring costumes out to people like the National Trust, amateur dramatic groups and film and TV companies, including the makers of Sherlock Holmes: A Game of Shadows. So, when you’re settling into your seat at the theatre, think of all the boot lacing, corset warming and bow-tying going on behind the scenes by people like Judith and her team.